First Tyee is on the Dock! With opening day tomorrow, the QCL crew is all on site, enjoying training week and putting on all the finishing touches! We’re already having a great start to the 2016 season! Our guides have been out on the water for the last few days getting a feel for the grounds and the current fishery. 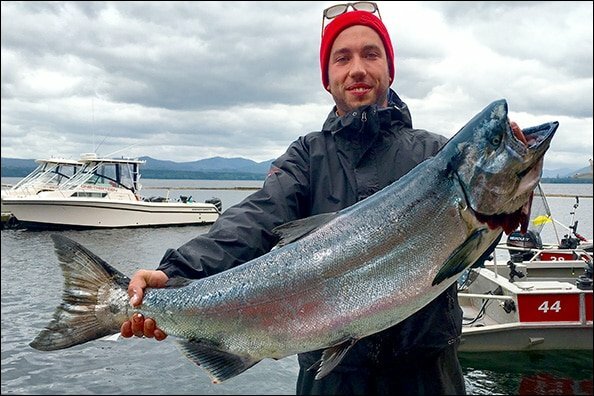 Yesterday marked the first tyee of the season, a 32 lb Chinook from Parker Point! Returning guide Tegan B was running an anchovy & teaser head at 52 feet on the down rigger and success came quickly. We’re seeing good numbers of early Chinooks out there, mainly 15 to 25 pounds, but it’s nice to know the big ones are present in the mix! We even had a Coho come to the dock yesterday afternoon! Boats out on the water were also greeted by a humpback whale feeding at Bird 2. We welcome the first guests of the season on Friday and hope to see the fishing continue like it has been the last few days. It looks like 2016 is going to be a fantastic season and we can’t wait to see all of you step off the helicopter! Our new Tyee Release Trophy… The traditional photos taken of anglers with their catch is a highlight at the Bell Ringer. But with many anglers choosing to release their Tyees, it’s a shame for them to miss out on the photo! This year we have a great solution! Look for these stunning trophies at the lodge this summer! Hopefully you’ll get to hoist one of these babies yourself! previousWe're ready to go fishing! Are you!